I like the colour of her scarf and the way she made it but I think some looser pants or a long skirt would look better and more modest. Love the shoes! She's sweet masha-Allah. I love her outfit just the half above. I agree with anon on the lower part. mashAllah I love your blazer! Yes, a long, straight skirt over the pants would be very nice and not change the look very much at all. The idea, however, is great masha'Allah! Very stylish her outfit rocks! The scarf colour is great. Pops right out of the outfit. To "anonymous" - I dont think it is very nice to say: "the sister may of have just started to practice"
Why coz her jacket is short and her jeans tight, that means she is only starting?? I know sisters that are pious and have good iman and do not wear hijab. Yes, hijab is good, but none of us knows what is in another's heart, do we? Being judgemental like this is not an attractive or an Islamic feature. @ Kathleeniti I think what the sister meant by "the sister may have just started to practice" is that she just started practicing wearing hijab,not practicing Islam. Trousers are ridiculous! Part above the catastrophic accident with trousers is just fab! Trousers are ridiculous! Huh that's not very nice! I like the jeans. They looks similar to a pair I bought from h&M. Sis your whole outfit rocks! Don't listen to any of these haterz! 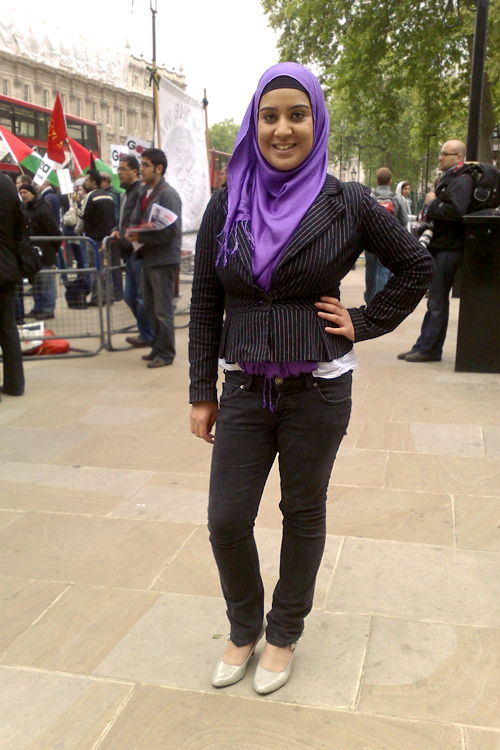 I like the outfit in theory, and I love purple, but I'm not sure why she tucked the scarf into her pants. anyone?